The Commonwealth Games were Delhi’s biggest sporting event ever, and also one that left a large imprint of national politics, also becoming a byword and the ills in India’s polity. 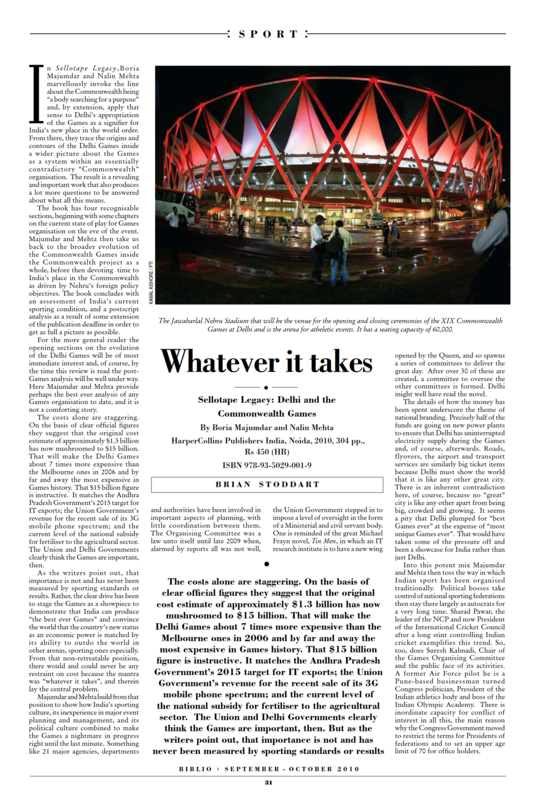 Published in the months ahead of the Games, this book is primarily the story of the politics of these Games, that money that was spent and the priorities that shaped them. With access to hitherto unexplored archives, including primary documents from the first-ever British Empire Games in 1930, this book is also the first and only attempt to place Delhi 2010 in perspective within the history of the Commonwealth Games, what they mean to the world at large and indeed the larger question of why need a Commonwealth at all. Blazing expose of what a humongous mess these Commonwealth Games have been. Boria Majumdar, a Rhodes scholar and senior research fellow at both a British and an Australian university, and Nalin Mehta, an honorary fellow at the University of Singapore, both sports buffs with solid backgrounds in their chosen area of specialisation—international sporting events—have produced a thorough, well-researched, sober and absorbingly well-written indictment of Everything You wanted to Know about CWG but were Afraid to Ask, the sub-title I myself would have chosen for this gem of an insight into all the pretensions, hypocrisies, distortions and vulgarisation of national values that have gone into the making of this circus. Boria Majumdar and Nalin Mehta marvellously invoke the line about the Commonwealth being “a body searching for a purpose”, and apply that to Delhi’s appropriation of the Games as a symbol of India’s new place in the world order. 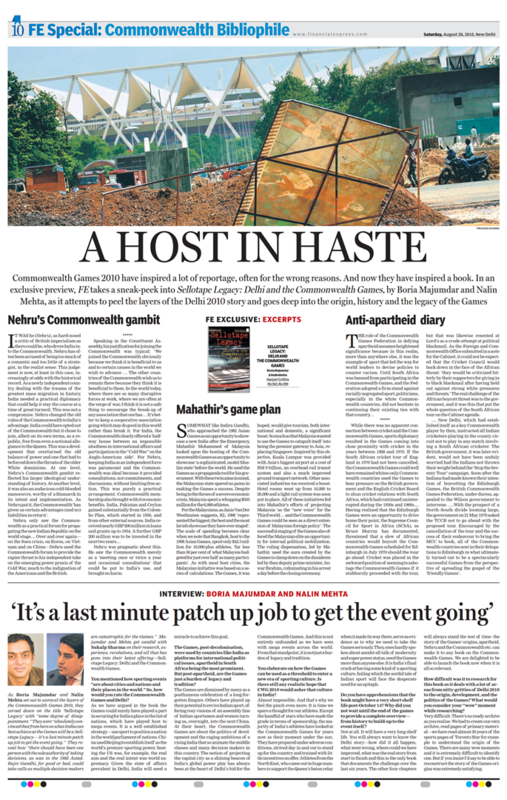 They trace the origins and contours of the Delhi Games inside a wider picture of the Games being part of a complex, even conflicted “Commonwealth” organisation. Sellotape Legacy’s usefulness remains current—a chronicle of everything that’s gone wrong with the Delhi edition…The book is…solid— the research detailed, the language crisp, the scale wide. It throws up pertinent questions, which do not have clear answers but reiterate what’s already in the mind of Indians who can see their tax money turn into coffee machines at the Games Village. 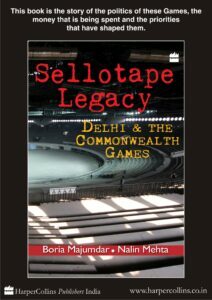 The book’s title, Sellotape Legacy, is prophetic in that it captures the mess the Delhi Games are in… Mehta foresaw it. 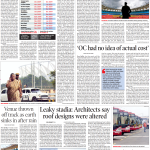 Majumdar and Mehta have made one of the few independent estimates of what the 2010 Commonwealth Games have cost India, including all related infrastructure. Their tally comes to around $17 billion – more than 110 times the first cost estimate prepared by organisers in 2002. 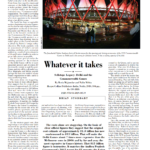 Boria Majumdar and Nalin Mehta have produced the definitive word on the contentious event [Commonwealth Games 2010]… [The authors] reconfirm their expertise in drawing the bigger picture on issues of sports and placing it in a historical context. At its core, this is about the politics of the games, urban development and the artificial ambitions of India Rising. The picture they paint is not pretty. Boria Majumdar and Nalin Mehta talk about the intransigence, the false promises and the mad budgets that have come to symbolise the event…At their heart, the Commonwealth Games are about the politics of development and the raging ambitions of a rising India that so animate the middle classes and many decision makers in this country. 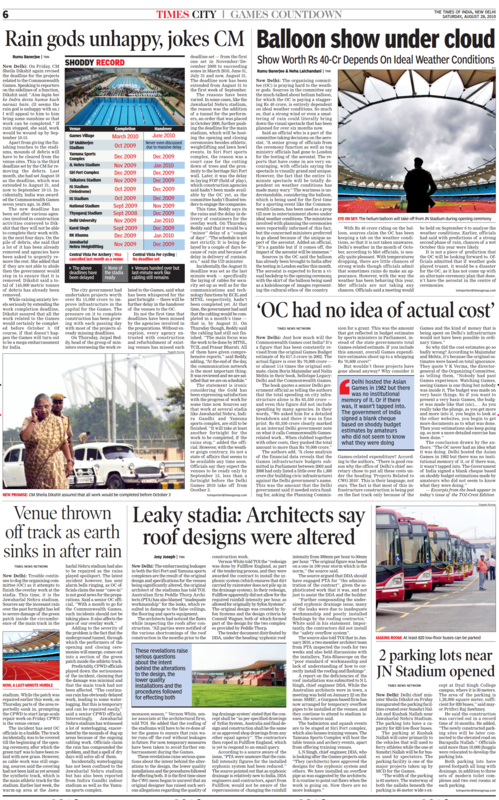 Fuelled by the unrelenting fear of global ridicule that so drives our weak egos – and by the colour of money – politicians, bureaucrats and India’s sports czars have taken the citizens of Delhi on a ride that will change their city forever. Sellotape Legacy reveals actual Games’ spending… The startling figures, which appear in Sellotape Legacy: Delhi and The Commonwealth Games (HarperCollins India) by Boria Majumdar and Nalin Mehta, can only cause further embarrassment to the Sheila Dikshit government, which has been on a taxation spree on the pretext of the Games. As Boria Majumdar and Nalin Mehta set out to unravel the layers of the Commonwealth Games 2010, they zeroed down on the title ‘Sellotape Legacy’ with “some degree of disappointment.” They were “absolutely convinced that from here on what India can best achieve at the Games will be a Sellotape Legacy— it’s a last minute patch up job to get the event going. 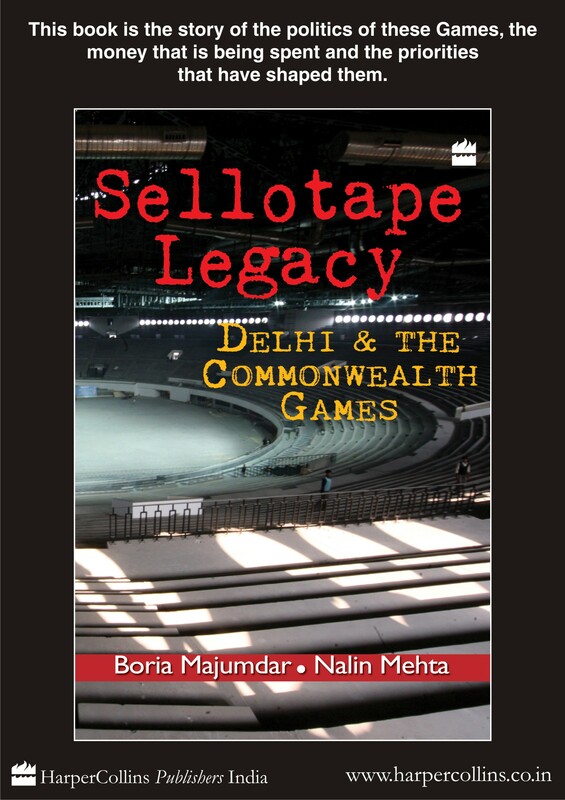 Sellotape Legacy (Delhi and the Commonwealth Games) by Boria Majumdar and Nalin Mehta is very timely and on the dot. As more and more details of sordid corruption and financial profligacy surface with unfailing regularity, here is an extremely well-researched book on the Commonwealth Games (CWG) by two authors who probably had a bead on all the major players involved. In Sellotape Legacy: Delhi & The commonwealth Games, sports scholar Boria Majumdar and historian Nalin Mehta have sought to put the Delhi Games in a larger perspective, not just from a historical point of view, but also bringing in aspects of sociology, of the politics involved, of governance, and most importantly, of a legacy…It is a damning indictment…a well put-together, referenced and annotated document. There seems to be no end to the skeletons that are tumblings out of the Delhi Commonwealth Games organisers’ cupboard. 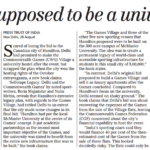 While making the bid,organisers had promised that the ‘Post Games’ Village (residential place for the sportspersons) will be utilised to provide hostel facility for the Delhi University… This plan was published in cold print but was never heard of once Delhi won the bid. 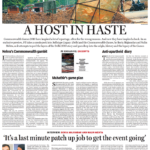 Delhi’s Games masters had always intended on selling the real estate and the much-needed DU hostel plan was given a quiet burial…This and several other unkept promises made by the Organising Committee and many things not factored in before Delhi made the bid have been highlighted by sports writers Boria Majumdar and Nalin Mehta in their book ‘The Sellotape Legacy: Delhi and the Commonwealth Games’. 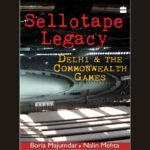 Sellotape Legacy’ by Boria Majumdar and Nalin Mehta asks pointed questions, specifically with reference to Delhi and the Games – the costs, who benefits, who stands to lose. The book provides figures to prove this….When the government approved the Games in 2002, the budget estimate was just Rs 617.5 crore. In seven years, this shot up to Rs. 70,608 crore! Obviously someone got their math wrong. 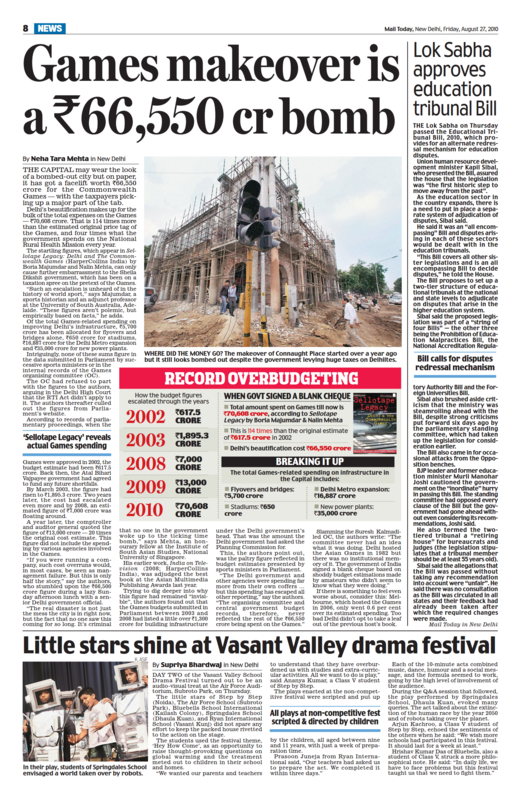 Scared of losing the bid to the Canadian city of Hamilton, Delhi had promised to make the Commonwealth Games (CWG) Village a university hostel after the event, but scrapped the plan when the city won the hosting rights of the October extravaganza, a new book claims. 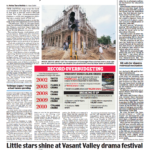 ‘Sellotape Legacy: Delhi and the Commonwealth Games’ by noted sport-writers, Boria Majumdar and Nalin Mehta, reveals that Hamilton’s extensive legacy plan, with regards to the Games Village, had rattled Delhi to an extent that the city made some changes in its final bid.. The book also says the bid commitment was quietly broken once the hosting rights were won.